The following are a collection of testimonials kindly contributed from clients I have had the great pleasure of working with in the last few years. Whilst Rebecca has successfully helped me overcome physical difficulties such as sciatica, back pain and severe lung infection, the effects of her healings are much further reaching. I noticed gradual changes in my energy levels, sleep patterns, outlook and understanding. During healings I have variably felt warm and cool air, a gentle electrical ‘charge’, weight lifting from problem areas and even the sensation of additional hands on me. Always, however, I feel completely relaxed and nurtured. Rebecca is a genuinely gifted and powerful healer. Waste no time in trying to get an appointment. 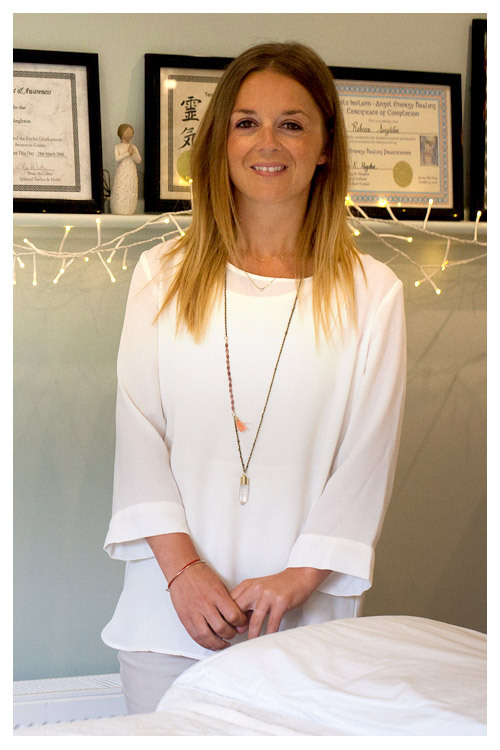 I have been seeing Rebecca for Reiki Treatments for the last few years – I did not know what to expect at first as I had never been previously. It has made a huge difference to me in my everyday life. I originally decided to try Reiki as I was having a lot of trouble with broken sleep and was desperate for a good night’s sleep. Over the time that I have been going to her, Rebecca has helped me with tummy problems, a sports injury, calming my mind down, as well as with sleep. She has also, amazingly, gotten rid of colds and stuffed up sinuses too. I have gone to Rebecca at particularly stressful times but I also find that regular appointments with her make a huge difference. After an appointment, I always feel much calmer or better about whatever I have going on at that time. After one particular visit, I went straight out for dinner with a friend and she could not believe how relaxed I was after my session. This is a regular feature of an hour with Rebecca. Rebecca is a really lovely person who is very interested in helping the clients whom she sees. She will always put her greatest effort into treating her clients. I always look forward to my appointments with her. There is never any pressure to book future appointments and she is flexible in seeing clients to suit their schedules. I have recommended her to friends, who have also found her great. I have no hesitation in recommending her to anyone, she is a little oasis of calm in a very hectic world. I’ve been going to see Rebecca Singleton for over 5 years on a regular basis, every couple of months at least. For me it is an essential part of caring for my well being. At certain times I’ve had particularly difficult issues such as stressful situations, or bereavement. At these times I was so grateful that I had Rebecca’s sessions to keep me strong and help me feel supported. Other times I just need a boost of whatever magic Rebecca provides to help me feel centred, grounded, connected again. I don’t know how it works, but it is enough for me to know that I can trust Rebecca and that she has a special gift for healing. The sessions are quite simple and very relaxing. After a short chat, you lie on a plinth for about 40 mins. I usually fall asleep or just feel very relaxed, Rebecca will offer observations or feedback. Then the session is over. Afterwards I feel like a cloud has lifted and usually feel emotionally clear headed. Aside from Rebecca’s healing gift, she is also a very practical, good humoured, down to earth person and always a pleasure to meet. I highly recommend visiting her for any kind of healing you need. Rebecca was highly recommended to me by another wonderful healer and I’ve been a very happy client of hers for four years now. I’m delighted with the progress I’ve made since starting to see her. Rebecca’s subtle but very powerful healing techniques have helped me work through issues I’ve carried with me throughout my life, whether physical or emotional. She has helped me to free myself of old burdens and given me tools to cope with new hurdles. I’m delighted that my quality of life and personal confidence has greatly improved since having regular sessions with Rebecca. She’s insightful and highly intuitive, and it’s a great source of support and comfort to me that I can confide anything in her and know she will effectively help me deal with it. Rebecca has helped me grow into myself and have the courage to pursue my dreams in all areas of life with confidence. The first thing I do when thrown a challenge is get on the phone and arrange an appointment. I have been so lucky to have attended Rebecca for many healing sessions over the last 7 years. Every healing with Rebecca is a lovely experience, I always feel peaceful, calm and re-energised after each session. Health issues initially brought me to Rebecca and I have been able to work through many issues, both physical and personal with great ease, with her assistance. Rebecca naturally and intuitively works with whichever energy is needed during each healing to achieve the best outcome for every client, she is a very gifted healer and teacher and I would highly recommend seeing her for a healing as each session is both of benefit and enjoyable. Rebecca works with wonderful empathy and integrity and it is obvious that her work as a healer gives her great joy. On the run up to Christmas I was suffering from back pain which was particularly bad when driving. I decided to try alternative solution having successfully had reiki treatments for stress I decided on Reiki for physical pain. On entering the treatment room I was made feel at ease and work began on my lower back. Crystals were placed around the effected area and I felt heat in the lower back and a sensation that the pain was being pulled out of my back. Throughout the entire one hour treatment I had my eyes closed and was in a state of deep relaxation. At the end of the session I was told that the pain may not leave for another day. On the drive home I noticed some minor improvement but the next day the pain had totally left me. I would highly recommend Reiki as an enjoyable and relaxing treatment with Rebecca. I first went to Rebecca after a family dispute which had really upset me and was weighing heavy on my mind. It was all I could think about morning, noon and night and I felt very vulnerable when I walked in her door. Rebecca was highly recommended and has had years of training so I knew I was in good hands. I fell into a deep restful sleep during the first session and after I woke up I felt much lighter, happier and positive. Rebecca recommended that I have four sessions. I have now had three and already feel like a different person, much stronger – even she says my aura has healed and is stronger. Meeting Rebecca has opened up a whole new world to me, she works on the emotional and spiritual levels and releases stored energy blocks maybe from past hurts from the body. I can’t imagine how long it would have taken me to get over my hurt if I had not tried Reiki with Rebecca. She is a wonderful, talented healer. I would highly recommend that everyone try Reiki as it heals on our physical, emotional and spiritual levels.